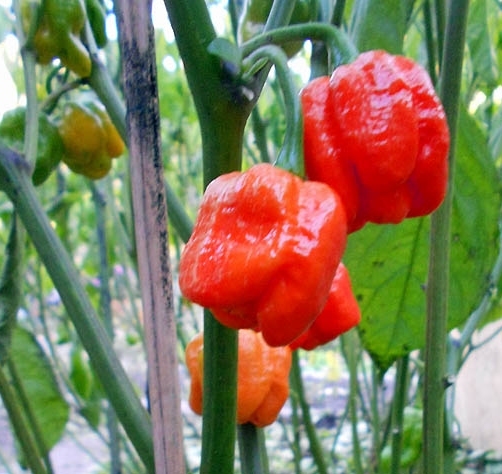 The Trinidad Moruga Scorpion held in 2012 the record for the world’s spiciest chili for one year, before the Carolina Reaper took its crown. It is a cultivar from the Capsicum chinense species and was bred in Trinidad/Tobago. Measurements of its heat level gave average values of more than 1,2 million Scovilles with top values of up to 2.009.231 SHU, the first time that a chili plant had reached values over the magic 2 million mark. The dried Trinidad Scorpion Moruga is extremely spicy, but also has a very fruity taste with a flowery note, which is suitable for spicing up curries, stews, dishes with tomatoes or paprika sauce, white meat, fish dishes, and all exotic recipes.